I'm sure there's a good excuse reason as to why my blog posts occur a good month after whatever it is I'm writing about has happened, but since I'm currently typing this out at 3AM, I'm just going to pat myself on the back for finally picking up the blog again, haha. Of course, the simple answer is "life happened". I really don't know where the time has gone, seriously. My days seem to just get sucked up by work or people; mundane things, extraordinary things; and finally, the need for proper rest and/or sustenance, be it physical or emotional. But whatever. That's not the story I was planning for this post to tell, and I'm getting ahead of myself again. Let's start at the beginning. Or at least, the beginning of this story--my journey to India. If you want the boring details, (or the necessary ones for context, whatever), I flew to India mid-August to attend an international youth conference. I was there for nearly two weeks, and it was my first time travelling to India--a place that, to be honest, I probably would not have the occasion to visit in my life were it not for this one. To be honest, I don't have much to say about my Indian experience--at least no huge life-changing moments or insights. It was an experience that I am grateful for, however. Although whether that can be attributed to my time in India itself or throughout the conference, is harder to say. Perhaps I will just be vague and say both, haha. We arrived in India two days before the conference to explore the 'true, local India' before being tucked away in a grand hotel for the conference for the remainder of the trip. Unfortunately, I was taken out on the first day by a violent food allergy reaction, (one that left me rather scarred for the rest of the trip to eat anything remotely local, sadly). 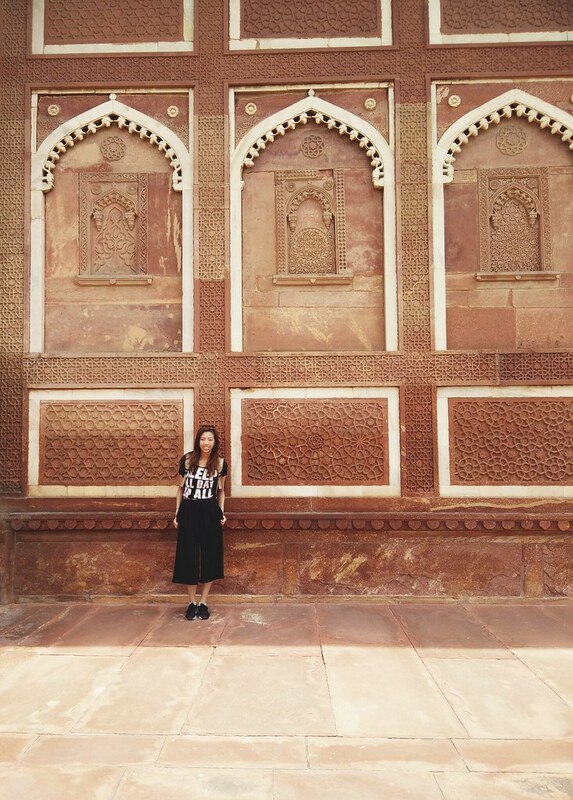 The second day proved to be a bit better, where we got the chance to visit and marvel at the wonders of India, namely, the Taj Mahal, and Agra Fort! I can't really talk about these two places without mentioning how it felt to be India in general--namely, overwhelmed. Overwhelmed by the heat, by the amount of people, by the sheer feeling of foreign-ness, by the chaos, by the magnificence, and on it went. I hadn't been rendered a true foreigner through travel for a very long time. Back in home in Canada, the diversity of the population coupled by the fact that I grew up there meant I had no qualms about belonging there. Even in Hong Kong, or Seoul, my appearance fit into the norm, I still blended in, and by default, fit in somehow. In India, however, I was without a doubt a foreigner just by default of being myself. Walking down the street we would get numerous glances, not only because of our ethnic origins, but I assume to some small extent, also because the majority of our group was female. It was a sort of disembodying experience. But to add to that, despite feeling like a stranger, we were in no way treated as outsiders. India is famously diverse in itself--a whirling, vibrant, and astounding chaos of beautiful culture, both opulent and humble. And in that diversity, we were greeted with a welcome that was unassuming as it was bold, an invitation to enjoy the fullest of India, while simultaneously mingling with people hailing from literally all around the world--126 countries and territories, to be exact. What I gained from this experience of having gone to India as a whole, was a refreshed perspective, a reminder to look outside of myself and to strive for the bigger picture. Also, the knowledge that I am not alone! At first I thought, how funny that I came to such a conclusion in a place where I felt so alienated. But in India, at least I expected it. I expected the jolt of culture shock, the utter unfamiliarity and the inevitable fear that followed. I hadn't, however, expected to feel some semblance of alienishness in HK. I guess this whole loneliness thing has been more of a struggle for me than expected. But in India, of all places, I met my 'group'--those who were in the same boat as I was, in the same job title. I guess what I'm trying to say is I finally sort of felt in my element.